Spain is paradise for foodies and one of the top dishes you can never miss is “cochinillo”. Where is the best place to have it? The answer is Segovia Spain, just an hour drive from Madrid. You don’t just come here for the food, the place is also well-known for its 2000 years old aqueduct which is majestically above the streets and monuments of Segovia city. After visiting the Roman aqueduct, we went to the restaurant we booked for the “cochinillo”. “Cochinillo” is a suckling pig fed on its mother’s milk, between the ages of two and six weeks. The way Spaniard cooked is as a whole, put it in the oven with their secret recipe and served hot with a crispy crust and the best place to have this Spanish cuisine of Castile is in Segovia. The Restaurante El Cordero is about 10 minutes walk from the Segovia Aqueduct. There are narrow cobbled stone streets and old buildings along the way. Most of the buildings here are fairly old & rustic so including the restaurant that I am about to dine in – El Cordero. The restaurant is quite big and separates into a few sections. It serves few types of customer, group tourists on a tour, stumbles on tourists and locals. The group tourists will be given seating in the underground basement. The decoration of the restaurant is quite fun to see, I like the old lamp hanging on the ceiling and how the owner used fresh vegetable such as pumpkin and squash to displayed at the different corner of the restaurant. Upon entering the restaurant, you see a tapas bar which is for the local I suppose. There are also a few tables at the entrance for customers with the smaller group. Up to 4 pax only. For tourists with a bigger group, we need to go down to the basement. It is quite interesting to visit the old building layout in Segovia city. The staircase to the basement is narrow and the wall is decorated with paintings, picture, and posters. At the basement, there are already few groups of tourists dining. As usual, you see Jamon, the Spanish ham line up at the top of the ceiling. The first dish is the big bean soup which is also a signature in Segovia as these beans are huge and coming from the nearby town of La Granja de San Ildefonso. We can’t really see the beans anymore because it has been mashed so it is easier to drink I guess. Then follow by the salad consist of olive, fresh onion, and tomatoes. The main course is the roasted suckling pig and usually best to go with wine. Wine is very cheap in Spain restaurant around 2 euro, many times can be cheaper than soft drinks. People in Spain have been eating Cochinillo ever since Roman times. It’s a popular dish in the Castilla and Leon region but Segovia has the best reputation for cochinillo. If you are not visiting Segovia, you can also find cochinillo in Madrid. Dessert is ice-cream, super sweet for me so I didn’t finish it. The basement wall is decorated with many pictures, mostly showing the culture and arts of Spain and some famous people. You see Jamon hanging all over Spain restaurants, at the window display of the restaurants or at the bar counter when you enter. There are two types of Jamon in Spain, Iberico, and Serrano. Iberico cost a lot more because the pigs are fed with a special diet, such as acorn and herbs and can roam freely. The process of making the ham is long, about 18-24 months and at the third stage of the curing process is the drying stage and this Jamon will be hung by the hoof with ropes. You can also see a plastic cup at the bottom of each ham for the fat/oil dripping. At the toilet entrance, there are cute pictures at the door to show ladies and gents toilet. You can also find cochinillo, the Spain style of roast suckling pig near Madrid but Segovia is the “place” for this suckling pig cuisine. Crispy on the outside and tender and flavorful on the inside which melts in your mouth, similar to the Chinese roast suckling pig. If you love meat, this would be a wonderful dish for you and do remember to pair it with a glass of wine. I would love some of that! Pork is one of my favorite meats, and I’ll bet that pig is extra tender. Pork is also one of my favorite and I love meat so I am really happy to taste this iconic dish in Segovia. What a neat place to visit. Sounds like you had an amazing trip overall. I think Segovia would be a fantastic place to visit and it is great when you find delicious foods on vacation. I haven’t been to Segovia yet but I do live in Spain, so I might make it there at some point. I live in the South, so Madrid is a good 6 hours drive away. The suckling pig sounds delicious. Unfortunately the other dishes do look like they were made for tourists. Better find a small home owned restaurant than going to a big one where tourist groups go. There is such a difference in the quality of the food. That restaurant looks like the real deal. I’ve never had suckling pig before but could eat Jamon all day. Will have to stop by here the next time I’m in Segovia. Haha, Jamon is really the Spain national dish! I was very surprised to see them hanging all over the restaurant, at the entrance or bar counter or window display. What an interesting sight! The place was very entrrtaining. There is so much to see and the dish or menu looks new to me. Love to visit this place soon! You are right, Segovia is a nice place to visit and you can spend a whole day exploring the city. And make sure you have the roasted suckling pig as it is famous in Segovia. Am yet to visit Segnovia, looks an amazing place to travel to. 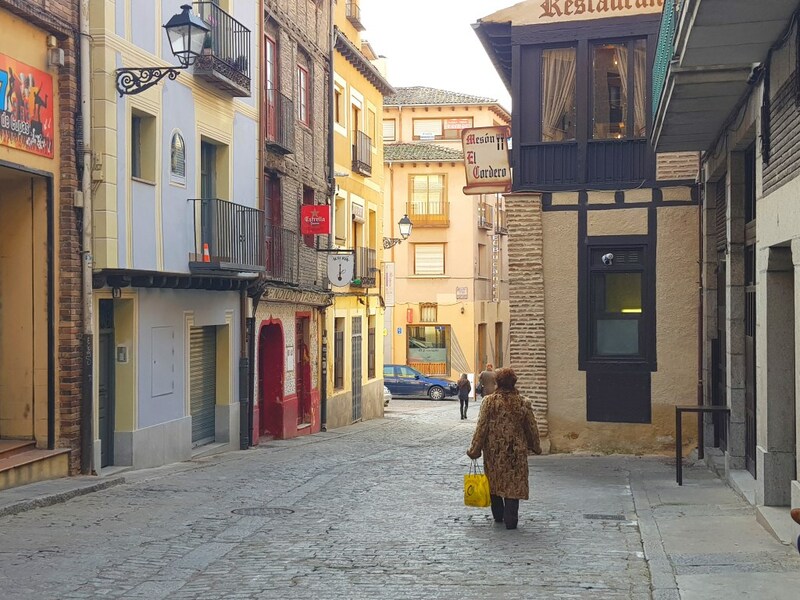 Segovia is certainly worth to do a day trip if you are visiting Madrid. A quiet town which is very pleasant to stroll around and one of their top attraction is the 2000 years old Roman aqueduct. Looks like a very unique experience! What a quaint restaurant too! You are right, it is quite a unique experience for me to dine in the Spanish restaurant in a small town of Segovia. We don’t have so many Spanish restaurant in where I live so it is really great to dine in here. And we don’t usually have cellar in Asia so this is another great experience! the food looks amazing! just wanted to also say your photography is so good, really get a feel for the place from your images. Thanks for your compliment about the pictures and glad you like them. The number one dish is the roasted suckling pig which tasted really tender and juicy and the second well-known dish is the big bean soup which usually goes together with the roasted suckling pig. I love taking in the local culture of places I visit and I find the best way to do that is through the cuisine. From the photos, that soup looks divine and the salad looks fresh. I’d be game! You are right, traditions and culture are deeply rooted in food and through culinary. We learn so much from the food in Spain and it is the best way to learn about the culture through food. I love pork, so i’d be willing to try the suckling pig. This restaurant looks cozy and quaint! The restaurant really have some interesting deco which I quite enjoy, such as huge pumpkins can be seen in every corner. The restaurant seems to have an old world charm. Looks a nice place to be at. Hey, you are totally right about it. It is an old fashion European restaurant and feel very cosy too. If you love pork, then roasted suckling pig won’t go wrong for you. The meat is very juicy and tender. This looks like my type of restaurant! I love Spanish food and Spain in general, and enjoy a good pork dish every now and again! Spain is the paradise for foodies and one of the must eat dish in Spain is “cochinillo” – the roasted suckling pig and the best place to have it is in Segovia. That roasted suckling pig and the salad sounds really appetizing and delicious. What a great place to visit! The salad sounds amazing, but I think I would have a hard time eating the pig. It definitely looks like an authentic dish though. What a cute little place, I love all your photos. That suckling pig looks amazing. I love trying new things looks awesome!